In the last post in X-Cart blog I was helping you take first steps in the eCommerce SEO. We’ve discussed a few basic and important tips that will help you improve your store’s visibility. One of them was optimizing every bit of content that appears on your website. Indeed, content optimization is one of the biggest factors when it comes to SEO tactics. That’s why today’s post will be just about creating content that is both user and search engine friendly. Here is my personal step-by-step guide for making any content not only more popular in SERPs (search engine results pages), but also among your visitors and clients. The key to making content a successful part of your SEO activities, is not to fill it with the relevant keywords, but to make it worth reading. It is of course still a necessity to place important phrases throughout the whole and each and every content that you publish. However, this won’t guarantee that you will rank high in search engines. Nowadays, keyword stuffing is not only ineffective, but can hurt your rankings and get you a manual penalty. Creating content that people will actually would like to read is absolutely crucial. Add a few of the important keywords while writing it and you will have a recipe for the content optimization success. How to find out what visitors would love to read? Do a research – examine what kind of content your competition is providing for their readers. Do they run a blog? If so, what kind of posts do they publish there and how often? What other types of content do they produce? Analyze every one of them and make a list of the stuff that you personally found interesting and useful. Then make another list of things which you would improve (present differently, write better) if they were to appear on your site. Ask your clients nicely – this may seem way too obvious thing to do. However the simplest things are the best. If you ask your visitors (e.g. with a survey) or your clients (via email maybe) what kind of information would they find useful and interesting, you will the exact answers that you need to know. Plus, you will show them that their opinions really matter and that you do care enough to ask them. Put yourself in their shoes – try to become your own client for a while. It may be a bit difficult at first – not to think like an ecommerce entrepreneur, but like a random client instead. Imagine someone that has multiple things to cope with on a daily basis and online shopping is just one of them. Think what content he would find precious and worth recommending and prepare such piece. A great content is a long-term investment that works not only for your SEO, but for building trust and making your store an important source of knowledge that people will feel comfortable to buy at. product descriptions – this the most obvious thing to provide your clients with. You can do it the easy (and totally not effective) way and copy each product description from its producer. This will make you almost invisible in the crowded place of your competitive online stores. If you choose to write them on your own, you’ll not only gain the opportunity to stand out from this crowd, but to optimize content with your own keywords. tips for users – any content that would help your clients make a better use of products which they’ve purchased at your store, will help you build trust. In a very natural way, this content marketing strategy can help you make your store an important source of knowledge that people will feel comfortable to buy from. tutorials – why not educate your visitors and show them different ways of how to use a particular product the right way, so it could serve them for a long time. If don’t have resources to create your own videos, use the ones already available from producers, but summarize them with your own words. photo galleries – every customer who decides to purchase a product online has little chances to actually see it live. The only sense that help him make a purchase decision is his sight – literally, he buys with his eyes. This means that the more product photos you provide, the better. Also, don’t forget that each and every uploaded picture gives you another chance to use relevant keywords. FAQ – this is an absolute must-have section at your store. For sure there are certain questions that your clients keep asking. Publishing the answers right away before new clients ask them again, shows that you care and value your visitors’ time. Not to mention that this written content is a natural place where you can optimize your store’s visibility with the proper keywords. blog posts – not every online shop has its own blog. Launching one and updating it with a good quality content may take a lot of your time. However, a blog is an awesome place not only for a website optimization, but for publishing different types of content that people will be willing to get back for. evergreen – should be always relevant and up-to-date and should always interest readers. Once you find out what kind of content it is worth to publish, you should carefully plan its creation. Content production is very time-consuming. First you should estimate how much of your time you can reserve for it and then plan accordingly. If it turns out that there you have no spare time left, consider outsourcing content production. But be careful, it’s not that you hire a ghostwriter, order a few topics and he does the whole work for you. Outsourcing content creation also requires planning and adjusting it to your audience’s needs. The more you plan it, the better content will be delivered. For example, if the range of your products is enormous, you might need help to write appealing product descriptions. Even if you outsource writing them to a professional copywriter, you still need to plan the process well. To make it a lot easier for you, here are some of the best tips, I’ve read lately. SEO is based mostly on keywords. As you already know, keywords are terms that people put in a search bar to find specific products, services or ideas. To make any optimization successful, it is crucial that you find out what are the exact phrases which people use to find the products you sell. Optimizing even the best content with the wrong keywords is meaningless. Choose “Keyword Ideas” and take a look at two variables for each keyword in the results: the average number of monthly searches and the competition for that keyword. A high number of average monthly searches shows that people are searching for that keyword. On the other hand, high competition suggests that other brands are currently dominating the front page of search results for those keywords, meaning that you are going to have a tough time getting your site noticed. The happy medium is somewhere in the middle – finding a keyword with low or medium competition which still has enough searches to be worth targeting. 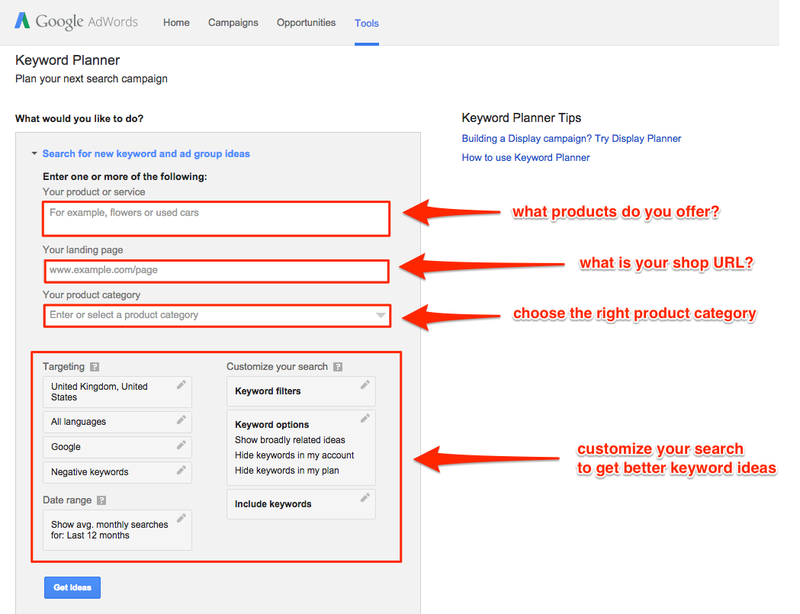 PRO Tip: If you feel that you need some additional help in using Google Keyword Planner, you’ll literally love this article. Another way of having a keyword research done is to use Positionly. 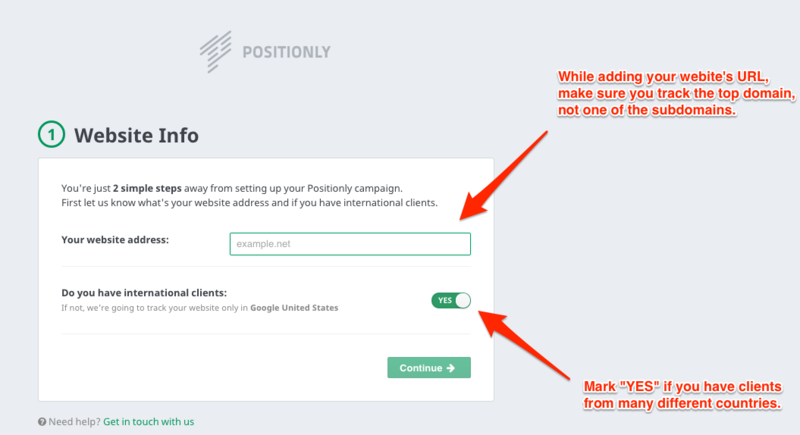 When you first sign up to Positionly and add your shop URL, we’ll suggest what keywords you should start targeting. If you’re already a Positionly user, you are able to add several websites and track many different keywords. Go to the upper section of your Dashboard, choose “Websites” and click “Add a new website” link. The next step is to choose in which types of search engines and countries you would like to track the position of your website. You can choose from: Google, Bing, Yahoo and Yandex and many countries from around the world. It’s shown on a screnshot too, you can enlarge it. That’s it! You now have a list of relevant keywords to track. A great thing is that you can sort and group them later. Search engines tend to rank the most recently updated sites higher. This means that the more frequently new content appears on your site, the better the chances that your shop will rank higher in SERPs. Keeping in mind different types of content that you can provide your visitors with, it is the blog that will be the easiest thing to keep current and updated. You can publish blog post whenever you can, however in terms of SEO the right thing to do is to submit posts regularly. It will be also good for maintaining a decent amount of website traffic and of course for converting random visitors into regular readers. If you didn’t launch your own blog yet, don’t worry – you can still update your website’s content each time you add new products to your offer. Additional to brand new product descriptions you can prepare new tutorials and update your photo gallery with new pics. No content optimization activities will be complete if you stick only to the on-page SEO techniques. Putting relevant keywords throughout your shop’s content is one (and very important) optimization technique, but nowadays this won’t guarantee you success. Social media signals and traffic that comes from other websites are the crucial factors that can make your content even more powerful. What I’m trying to say here is that you can’t stop only with publishing content on your website. You should promote it outside to achieve better results. Share your blog posts, tutorials, product galleries etc. on every social media channel where your shop have its own fan page. And of course engage with your fans! Once you start improving your website’s search rankings (no matter if you do it via on-page or off-page optimization techniques – read about them in my previous post “SEO for Beginners, part 1: First Steps in Making Your Store Visible to Search Engines”), you have to measure the results that you achieved. That’s the only way to know what’s working and what not and the only way plan and implement further improvements. Let’s say that there are certain keywords that don’t bring you much traffic. You shouldn’t wait too long to swap them with the ones that will perform better. 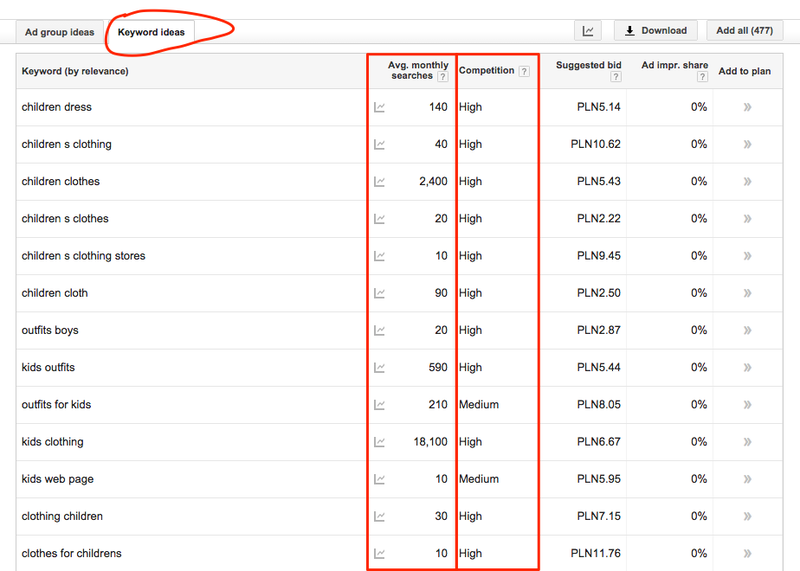 How to know which keywords are better than others? You will know it when you track them. You can do it quickly and effortlessly with Positionly. Log in to your account, click on “Websites” in the upper section of your Dashboard and choose your store’s website. (You can track many websites depending on what plan you’re in). You will see the overview of your store’s position and take a quick glimpse of how the keywords that you’ve picked are doing. To dive into the details pick “Keywords” from the “Website Menu”. 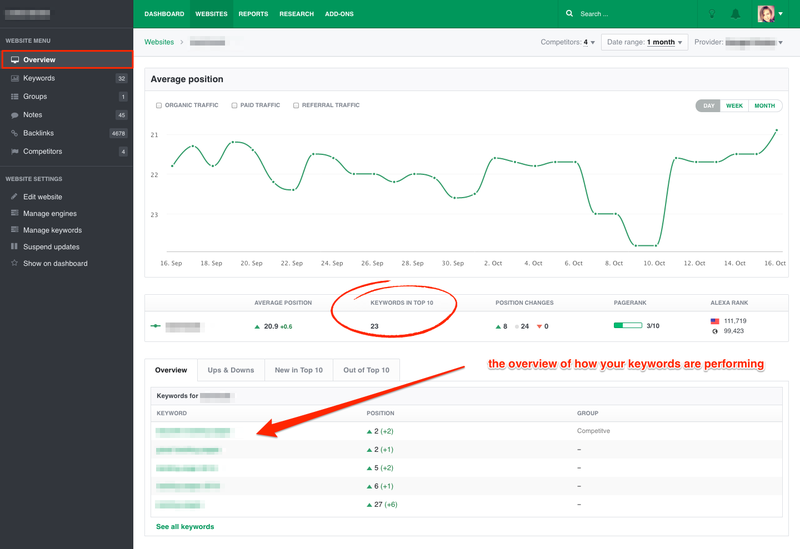 You will get a list of all your keywords with their positions marked (as well as the changes that appeared recently), the volume of competition, groups and links to a web page that appears in SERPs for a specific keyword. When analyzing keywords, don’t forget to check results for different search engines that you chose while adding your website. If you have a heavy amount of keywords that you’re tracking, it is recommended that you group them to keep things organized and clear. You can do it with just few clicks. After doing the profound analysis you should know exactly on which keywords to focus on to make your website rank higher in SERPs and to drive more high-quality traffic to your online store. Guys, I just gave you my recipe of how to optimize the website content. I use it on my daily basic and it’s working well for me. If you decide to implement my strategies, I’d love to hear your feedback and how it worked for you. If there’s anything that I’ve missed or anything regarding content optimization that you’d like to discuss with me, I’ll be happy to chat with you. Also, if you have any questions about SEO, SEO tools or Positionly, don’t hesitate to leave your comments below or drop me an email directly at kinga@positionly.com. Kinga is the in-house ninja when it comes to content marketing. She loves exploring the marketing and SEO world, learning new things and writing about her experiences. She is also a big startup enthusiast and an amateur dancer. Positionly is a friendly and easy-to-use SEO software that offers accurate and professional tools. Thanks to the plain design and simple interface, Positionly is suitable also for startups, small businesses and freelancers that do SEO on their own.